Using real-time, high-speed peer-peer communication facilities over the ethernet, the MiCOM Alstom P842 provides a distributed scheme for delayed auto-reclose (DAR) and auto-isolation of a mesh bus station. Its flexibility means it can be used with different bus-bar arrangements.The MiCOM Alstom P842 Mesh Corner Reclose unit (MCU) provides a flexible, distributed scheme for delayed auto-reclose (DAR) and auto-isolation of a mesh bus station. 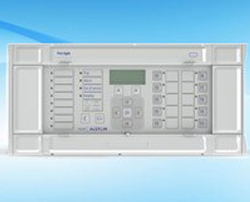 The MiCOM Alstom P842 uses high-speed peer-peer communication facilities over ethernet, and provides for the automatic reclosure of circuit breakers. It also ensures automatic isolation of a persistently faulted plant and suppresses ferro-resonance following a system fault. The equipment is provided on the basis of one MCU per mesh corner. Although each MCU is an autonomous unit, inter-unit communications guarantees co-ordinated control of a complete mesh system. The MiCOM Alstom P842 ensures that only the faulted electrical plant is isolated for permanent faults. It provides flexibility for different busbar arrangements, carries out system checks, and suppresses ferro-resonance. MiCOM Alstom P842 is equipped with real time peer-peer communications and allows easy commissioning and 'fault-finding'.